Conversion Rate Optimization is an ever-changing, cyclical process. In this article, we will present our custom-developed CRO campaign workflow, consisting of 6-steps designed to increase your conversion rates and revenue. In the CRO process of 6 consecutive steps, this first step is the only solitary instance, while the other 5 steps are recurring. Once we establish initial business objectives and expected website performance, unless any global changes are present, there’s no need for this first step to be repeated. 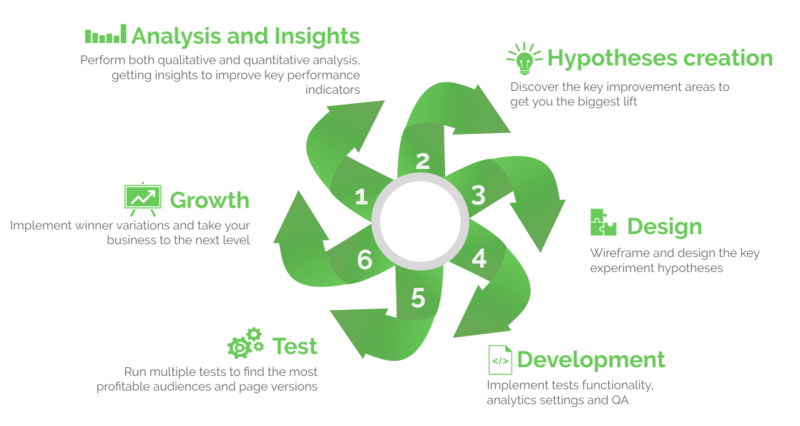 The other five steps of hypothesis creation, designing, developing and running a/b tests in conjunction with conducting post-test analysis form an ever-repeating cyclic CRO process. Because CRO is an ongoing, iterative and dynamic process, it is different from a traditional project or a product development definition. Therefore, you need permanent team members who are temporarily working on conversion optimization. They will showcase better performance as they know how to work with each other, have an established workflow and pursue a common goal. CRO Project Manager is the moving power in any CRO project. He’s like a product manager as he has to deal with product metrics and analytics. He sets up a consistent experiment framework and supervises the whole process from requirements to final optimizations, mediating between the customer and the CRO team. UX Expert optimizes customer journeys. Web Developer has experience with A/B testing and, comfortable with heterogeneous environments, various tools, and integration scenarios. Quality Assurance specialist makes sure A/B tests and analytics tracking are set up correctly before they go live, while they are live and after winning variations are implemented into the site. Formalizing the core business goals and website function. Defining the source of a business’s income in the short and long term – what mechanics are present on the website and facilitate processes and actions? What is missing? 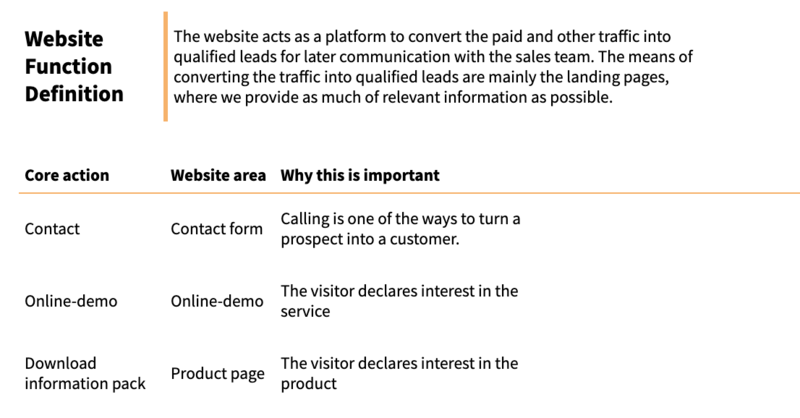 The deliverable of this step is one to three sentences defining how the website is expected to deliver tangible results and a table of the core actions that we want the visitor to make on the website, then we move on to the CRO cycle. This is a health check of the tracking. Are we tracking the activities we need to measure, outlined in Step 1? If we aren’t, we cannot navigate or make educated decisions on the next course of action. 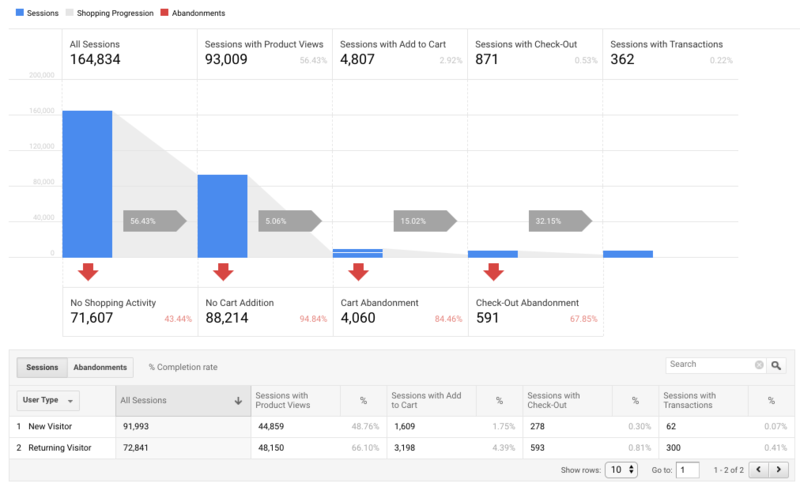 At this step, we are checking the Google Analytics or other analytical CRO tools and aligning the core action items with metrics that are being tracked. We need to verify that we track what matters and what we will use to make decisions later. If some issues were found, we make a list of the items that need fixing and provide clear direction on how to fix them. For online stores, setting Enhanced Ecommerce is a must. It will give you insight into ecommerce shopping activity: product page views, adding and removing products from shopping carts, as well as all initiated, abandoned, and completed transactions. 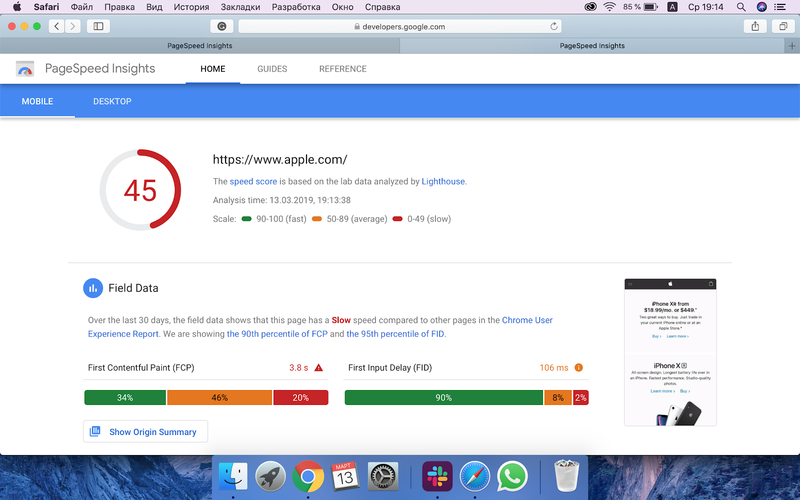 Page load time: We analyze the loading time of the main pages as well as product, pricing, sign-up, and check-out processes on different devices. A high page load time reduces the potential for conversion so this is one of the priority CRO indicators that needs to be fixed. Cross-device and browser functioning: As CRO agency, we make sure the website performs well across the most usable devices and browsers to avoid drop-offs. Demography and locations: We analyze if visitors from different demographics behave differently on the website and use this information for the conversion test optimization. Traffic sources and channels: Helps us understand which channels are performing successfully for the business, which allows us, a team of CRO specialists, to give recommendations on prioritizing the most profitable resources. Session duration and user engagement rate: Low user engagement signal us about the need of using CRO tools, adding visuals and optimizing the content of a page. Product matrix (for e-commerce): We check if some particular segments of audiences are interested in a particular segment of products. Based on these findings we make educated decisions on targeting specific items on the specific segment of users and personalizing product recommendations on the website. If a client is collecting qualitative data we also include the analysis of this data in the audit. If not, we include this conversion optimization service while working on the CRO campaign. User Feedback: Implementing a survey gives comprehensive insights about the visitors and their expectations which quantitative data can’t provide. Heatmaps: We recommend using CRO tools like Hotjar or Yandex.Metrica. 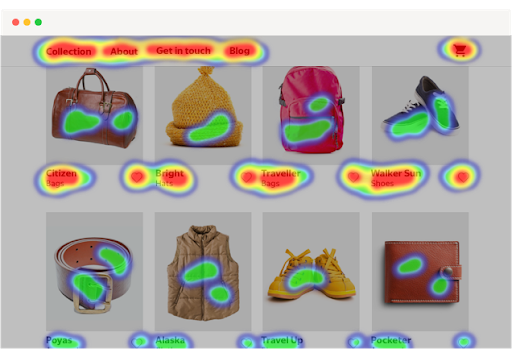 Heatmaps and Scrollmaps help to identify the common UX patterns being followed by website visitors. When the tracking is in order and the core actions are defined, we can start defining some of the initial hypotheses for testing. Mainly by means of heuristic analysis, we assess the main funnel(s) of the website, analyze conversion rate of each funnel step and pinpoint the most obvious points that could be hurting the conversion rates to the core actions. After analyzing all of the above, we create a Testing Plan Document – a list of prioritized tests that aim to check whether the hypotheses we’ve outlined are correct. Each idea should have an ICE score assigned to it – representing its potential impact, confidence of success and ease of implementation. Creating the technical specification – the document that contains all the info required for development and quality assurance. Our goal is to have all the info in one place – text doc with tech specification, wireframes/mockups, and codes – GitHub helps us to have everything in order. For launching conversion optimization tests and services we use tools such as Google Optimize, VWO, Convert, Optimizely and also we have our own rotator in Google Tag Manager. The choice of CRO A/B testing tool depends on a client’s needs and goals. Running and monitoring conversion tests. Developing the final test report, which contains final test results, conclusions and suggested next steps. This is done only after the test has reached statistical significance and required sample size. As a CRO agency, we review the data that we have after the first tests and identify new opportunities and issues, updating the Testing Plan Document with the new hypotheses and conversion tests options.